Orchestras stay, while conductors come and go – so it normally goes. However, in the case of maestro Herbert Blomstedt you might think differently. He is 91, very active, and carries some 65 years of conducting experience with him. That’s more candles than many orchestras have to blow, including most of the period-instrument ensembles. 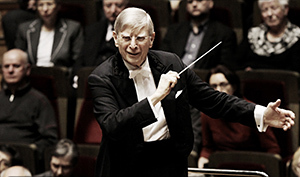 Blomstedt brings a communicative sense of joy to music-making and his conducting seems alien to any sign of routine or tiredness. Returning to Brussels with the Royal Concertgebouw Orchestra (RCO), Blomstedt treated us to a magnificent concert with utterly compelling readings of symphonies from Mendelssohn and Brahms. Read the full review on Bachtrack. Categories: Concert reviews | Tags: BOZAR, Brussels, Centre for Fine Arts, Felix Mendelssohn, Herbert Blomstedt, Johannes Brahms, Koninklijk Concertgebouw Orkest Amsterdam, RCO, Royal Concertgebouw Orchestra, Wilhelm Stenhammar | Permalink. Touring Europe, the Simón Bolívar Symphony Orchestra of Venezuela (SBSO) under their Music Director Gustavo Dudamel performed two concerts in Brussels. Dudamel already guested in 2009 with the Gothenburg Symphony, but for the orchestra it was a long overdue debut in the Belgian capital. The arrival of El Sistema’s crown jewel and its brightest gem had been well prepared in the media and not surprisingly on both nights the Centre for Fine Arts was filled to capacity. Perhaps not so much the new audience that is often mentioned in connection with “the Dude”, but people of all ages who still made it quite clear for what reason they attended the concerts. That recently the praised Venezuelan educational system received a fair amount of flak, or that the country itself is going through rough times, wasn’t going to spoil the fun. Dudamel and the Bolivars were in town. Categories: Concert reviews | Tags: BOZAR, Brussels, Centre for Fine Arts, El Sistema, Gustav Mahler, Gustavo Dudamel, Julián Orbón: Tres versiones sinfónicas, Ludwig van Beethoven: Symphony #5 in C minor, Marc Haegeman, Richard Wagner: Der Ring des Nibelungen, Simón Bolívar Symphony Orchestra of Venezuela | Permalink. With ballet music – Poulenc’s Les Biches and Act 2 from Tchaikovsky’s Nutcracker – framing the Piano concerto from Ravel, the Belgian National Orchestra under American guest conductor Andrew Litton promised an evening full of elegance, color and sophistication. Soloist for the Ravel was the Franco-Lebanese pianist Abdel Rahman El Bacha, laureate of the Queen Elisabeth Competition in this very same place in 1978, then a mere 19-year old. The present concert was in aid of CAP 48, a fundraising initiative of the Belgian TV network working hard for the integration of disabled people – though sad to see in this respect that the concert hall was only two thirds filled this evening. Categories: Concert reviews | Tags: Abdel Rahman El Bacha, Andrew Litton, Belgian National Orchestra, BOZAR, Brussels, Francis Poulenc, Les biches, Marc Haegeman, Maurice Ravel, Nationaal Orkest van België, Nutcracker, Orchestre National de Belgique, Palace for Fine Arts, Piotr Ilyitch Tchaikovsky | Permalink. Cancellations can go in every direction. An opportunity to see the legendary couple Claudio Abbado-Martha Argerich once more at work was abruptly shattered when the 80-year old Italian maestro had to annul his European tour with his Orchestra Mozart on doctor’s orders. It had been almost fifteen years since Abbado was last in Brussels, expectations were understandably high, but the “big comeback” was clearly not to be this time. And with Abbado out, so was Argerich, and the scheduled Haydn-Mozart program. Categories: Concert reviews | Tags: Bernard Haitink, BOZAR, Brussels, Claudio Abbado, Ludwig van Beethoven, Marc Haegeman, Maria João Pires, Martha Argerich, Orchestra Mozart, Palace for Fine Arts | Permalink. The Budapest Festival Orchestra is celebrating its 30th anniversary this year. Under the guidance of maestro Iván Fischer (co-founder with Zoltán Kocsis), the orchestra not only established itself as one of Hungary’s foremost cultural entities, it also went on to cut a strong profile on the international stage. The program they offered in Brussels was delightfully unusual and of the highest level throughout. Starting with a small oboe festival with pieces from the little-known Pasculli and Mozart, featuring the high-spirited François Leleux as soloist, it was the rarely heard Faust-Symphony from Franz Liszt which acted as the focal point of the evening. Categories: Concert reviews | Tags: BOZAR, Brussels, budapest festival orchestra, Centre for Fine Arts, faust symphony, François Leleux, Franz Liszt, iván fischer, oboe, Wolfgang Amadeus Mozart | Permalink. The acclaimed Chinese pianist Yuja Wang made her debut in Belgium with the kind of disparate program that would have made giants like Sviatoslav Richter think twice, yet which seems designed primarily to demonstrate how dazzling a virtuoso she is. (Richter played what he felt like playing at a particular moment, but that’s another story.) Wang’s Brussels recital was largely culled from her coinciding new CD-release, imponderably titled “Fantasia” and sounded in spite of the hyped promise of “a poetic evening” for the most part like a no-brainer, rollercoaster collection of miniatures and bravura transcriptions by Rachmaninoff, Scriabin, Debussy, Albeniz and Horowitz, wherein the difference between the official program and the encores eventually went completely adrift. The bits of late Brahms and Fauré thrown in for weight couldn’t dispel the frustrating feeling that this evening we only heard part of her talent. Or didn’t we? Categories: Concert reviews | Tags: Brussels, Claude Debussy, Gabriel Fauré, Isaac Albéniz, Johannes Brahms, piano, Sergei Rachmaninov, Vladimir Horowitz, Yuja Wang | Permalink.